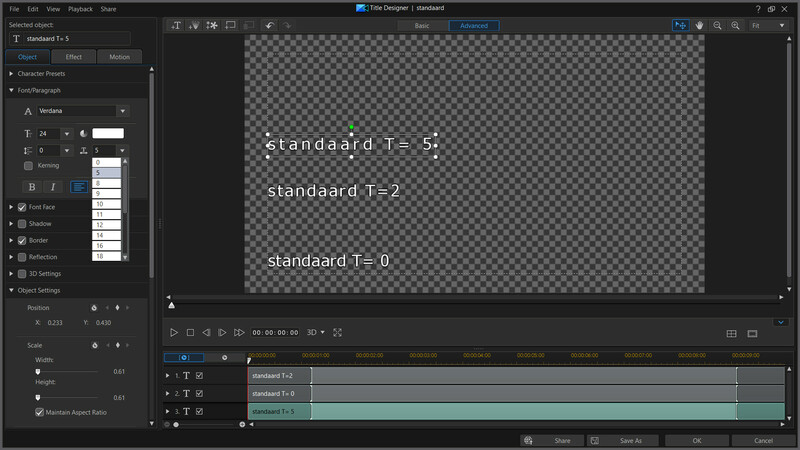 In Title Designer I cannot set the text spacing (parameter T) to small values like 1 or 2, it jumps from 0 to 5. So the values 2, 3, 4 are not more possible. Yet I think it was possible in the past because I have a custum template with the value 2, but when I try to change T the value changes to 0 or 5. My question is now: is this behaviour the same on other systems now? There is a difference in PDR16 from PDR14 in the numerical entry for the spacing value. Going back to PDR14, you could easily enter a single digit value, bypassing the drop down which goes 0,5,8,9 etc. Just highlight the value box and enter the digit - say, 2 - Enter and it is applied. In PDR15,16 and 17 it is not so easy to enter a single digit, as the box value now defaults to digit+a number - so 2 becomes 20, 3 becomes 35, 4 becomes 48 and so on. Quote In Title Designer I cannot set the text spacing (parameter T) to small values like 1 or 2, it jumps from 0 to 5. So the values 2, 3, 4 are not more possible. Yet I think it was possible in the past because I have a custum template with the value 2, but when I try to change T the value changes to 0 or 5. Roland vi, if you want a 2, I think you should be able to simply enter 02 and it will work just fine. For 3, 03, so on, true in other areas of PD too.